Mut Dates: January 22 – 31, September 8 – 22. Traits of Mut people: Ironic. Lucky Colors: Red for men, Brown for women. Associated Zodiac Sign: Scorpio ♏. According to the mythology of the ancient Egyptians, the goddess Mut was the second most important Egyptian after Isis for the Egyptians. It symbolizes the fair and just Mother. 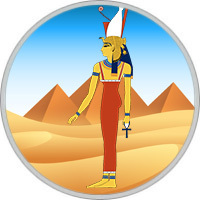 Around her head depicted two crowns: Upper and Lower Egypt. Sometimes it was represented as a lioness or neck. The children of Mut are very demanding both to themselves and to others. They are alien to romance, but they are always ready to help in deed, not in word. The inclination to exact sciences is inherent in them from birth: among them there are many engineers, inventors and testers. The world owes their talent to a great deal of invention, it is they who are making progress. These people are endowed with excellent health, endurance, resistance to illnesses and blows of fate. Their insight allows one to foresee the dangers and avoid them. You can call them reinsurers, but with them anyone will feel like behind a stone wall. However, they are characterized by melancholy or sudden mood swings from sadness to joy. They are incredibly critical, and only very patient people with self-discipline and great patience can get along with them. However, the children of Mut do not particularly seek to live with someone in pairs, often they prefer solitude and believe that this prolongs their life. If they really love someone, they’ll turn mountains for the happiness of their beloved. They themselves are very faithful and loyal, but their partners are often suspected of infidelity. Most of all, in relationships, they value harmony and peace of mind. A man born under this sign will put up a friendly shoulder to make you feel safe. Such people are prone to mood swings, in a state of rage are ready to destroy everything around. If you want to make friends with a Mut man, you will need to show patience and perseverance. In their circle of trust, they let only the elite. They prefer loneliness to big and noisy companies, they like to enjoy harmony with themselves. Native businessmen, capable of building an empire in a short time span. Love occupies an important place in the life of this person. The Mut woman tries to do everything possible to make an impression on her chosen one. At his feet, she is ready to put the whole human world. He can not always restrain his emotions, he is afraid of the future and expects support from close people. He suffers because of his insecurity, sees only good people in people, but is constantly disappointed. In an outburst of anger, an impulsive act can take place, which will then be regretted for a long time. It is necessary to cope with their depressing emotions, it is worth to visit a psychologist.